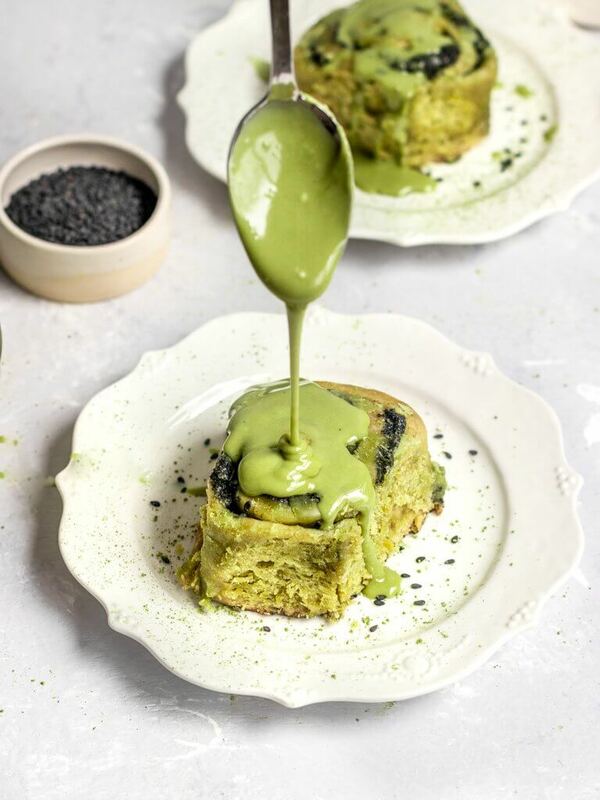 If you are a fan of matcha, then you should know that it pairs amazingly with black sesame! The first time I ever had matcha in a baked good I was blown away by how well the sweet balanced the grassy notes of matcha. Then, I stumbled upon black sesame seed milk and poured it into my homemade matcha. Immediately I was like- OMG this taste is great! If you know me at all, then you know as soon as I find a flavor combination I love I am immediately figuring out how to make it into vegan buns of some sort. 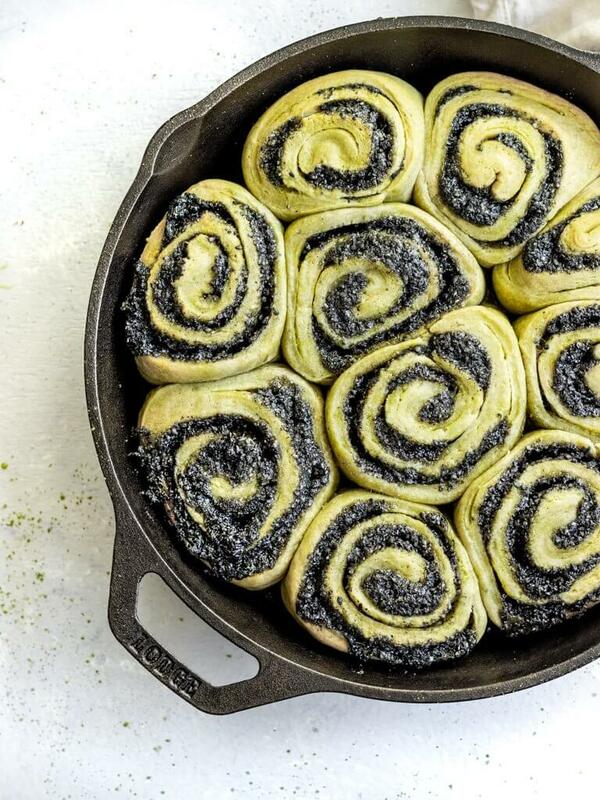 This is why I was SO happy when I finally perfected the recipe for these Vegan Matcha Black Sesame Sticky Buns! To say that Matcha is having a moment is an understatement. With any “trendy” ingredient comes different levels of quality and all matcha is NOT created equal. With the highest quality matcha powder, you are going to get the rich green vibrant color you see in these photos. However, once you use lower grade matcha from so-so brands, the color becomes a little more green-brown. So here’s a short & sweet breakdown of the different matcha grades out there as well and the brands of matcha I like best. This is the brightest green matcha. It’s made from young tea leaves with the stems and veins removed. This is the type of matcha I recommend for drinking, but it’s a bit pricey and unnecessary to be baking with. As you may guess by the name culinary, this is the grade of matcha that I bake with! This is honestly still great matcha to drink and is probably what you find in most of the matcha you get while out. It’s still green and smooth, but is a slightly duller green than ceremonial grade. It also pairs better with sweeteners and other flavors. There are actually 5 different grades of culinary matcha, which I won’t dive into here, but premium is the best. For this recipe, I used MyEncha Culinary Grade Matcha which is a premium culinary grade matcha. Matcha is unique to Japan, so green tea powder isn’t the same. Plus, it’s likely missing that bright vibrant green color. I don’t recommend substituting green tea powder in this recipe as the taste will be flat and the color will be off. I hope this gives you a base level start to baking with matcha. At the end of the day, use whatever matcha brand you trust and love! If you are looking for suggestions MyEncha or Due Ceremony are two of my favorite brands. By this point in my blogging journey, I know I have probably told you all time and time again the steps behind how to make the perfect vegan buns. So, rather than repeat myself, I’m going to share a few tips specific to this recipe. However, if you want some more in-depth tutorials, thoughts, and information you can check out My Instagram saved highlights or my Vegan Cranberry Orange Sticky Buns and Vegan Carrot Cake Sticky Buns! Whisk the warmed almond milk and matcha together BEFORE adding your yeast. You need the warmed liquid to break up the matcha so it doesn’t form clumps. When it comes to the filling, definitely use a food processor or good blender to get the right consistency. You want to get it into a super fine black sesame sugar. While some crunch is good, using whole seeds doesn’t taste as good. For this recipe, I bought used Terrasoul Black Sesame Seeds. While I made this recipe with matcha glaze, I also tested it with a lemon glaze and it was awesome. A Yuzu glaze might be delicious too. Just a thought- but if you try it let me know! Part of the reason I’m obsessed with making vegan buns is that they store SO wonderfully in the freezer. If you make a whole batch of these and can’t eat them all simply store in the freezer up to 4 months. I love using these glass storage containers to store any leftovers. When you’re ready to eat either put them into the oven at 200F to warm for 10-15 minutes (ideal) or heat them in the microwave for 45-60 seconds (not as ideal, but still good). So there you have it! Another awesome bun recipe that can be made vegan for all to enjoy! 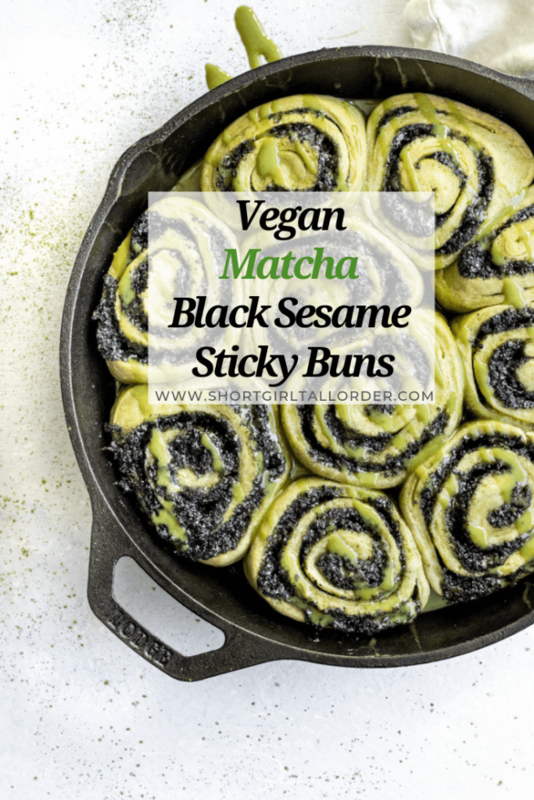 I really hope you have fun baking with matcha and love these Vegan Matcha Black Sesame Buns as much as I do. Happy Baking everyone! Begin by adding your warmed almond milk, lemon juice, and matcha to a mixing bowl and whisk until no clumps of matcha are left. Next, add in the dry yeast and stir. Let sit 5-10 minutes until bubbles form to be sure the yeast is active and working. Add your sugar and melted butter to the mixing bowl and whisk to combine. Then, begin to slowly add in flour until a dough forms. Use the dough hook to knead the dough for 5 minutes or take the dough from your bowl and knead by hand on a well-floured surface for 10 minutes until stretchy and elastic. Lightly spray a large bowl with oil, form your dough into a ball, and add to the bowl. Cover and let rise 1-1.5 hours until the dough has doubled in size. You will know the dough is done when you can push your finger into the dough and the dough does not spring back. About 10 minutes before the dough is done with the first rise, add your black sesame and sugar to a food processor and blend until ground together. Then, add in the cold butter and vanilla and pulse together until a thick paste forms. Set aside in the fridge until you are ready to use. Once your dough has doubled in size, turn the dough out onto a lightly floured surface. You will need to flour the rolling pin too so the dough doesn't stick. Roll the dough into a rectangle that is 1/4-1/2 inch thick in height. After the dough is rolled out, take your sesame filling out of the fridge and spread evenly across the dough. Make sure to leave a 1/4 inch border around the edges of the dough without filling. Beginning with the longer side of the rectangle, tightly roll up the dough into a log. Lightly flour the dough as you go to help if it gets a bit sticky. Make sure to seal the roll by pinching the edges together. Then, flip the dough over so the pinched seal is facing down. Once the dough is rolled, trim the ends and discard. Cut the remaining dough into 10 evenly sized rolls using a very sharp knife. Place into an 11-inch skillet or cake pan and cover with plastic wrap or a similar material. Leave in the fridge overnight (at least 6 hours) for a final rise. In the morning, remove the buns from the fridge and preheat the oven to 350F. Once the oven is preheated, bake the buns for 35-40 minutes until cooked through. Remove the buns from the oven and let cool. 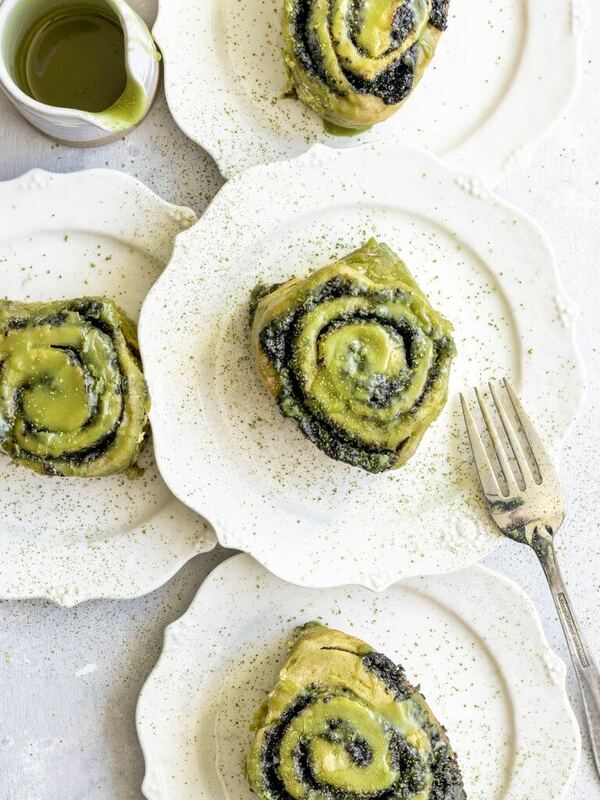 While the buns are cooling, make your matcha glaze! Add the matcha, almond milk, and lemon juice to a small bowl and whisk until no clumps of matcha remain. Gradually add in the powdered sugar and whisk until a thick but smooth glaze has formed. If you want a thinner glaze, you can add more almond milk, however, a thick glaze works best. Pour the glaze over the cooled buns and serve immediately. Enjoy!